Day in and day out many of us invest in beauty products, treatments and procedures to make us feel and look better but have you ever considered changing your look by changing your eye colour? 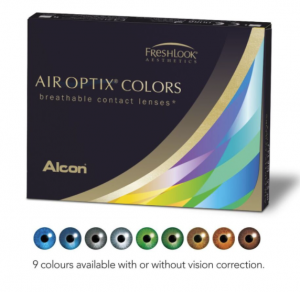 Here at EyeQ we use and recommend Air Optix® Colors by Alcon. Air Optix® Colors creates a beautiful look that blends in with any eye colour. With a combination of stunning colours, comfort and breathability, Air Optix® Colors are made with the unique SmartShield® technology known for creating an ultra-thin protective layer to help shield your lenses from irritating deposits. Whether you need vision correction or simply want to change things up a little, coloured contact lenses allow you to achieve both. With 9 colours available you can go subtle or dramatic and everything in between! If you are already wearing Air Optix® Aqua or Air Optix® Plus Hydraglyde®, you can go into Air Optix® Colors without the need for a refit from your optometrist. If you are keen on trying Air Optix Colors, contact your local EyeQ Optometrists today! Can dark chocolate improve our eyesight? Why is it important to wear sunglasses all year round? Something is wrong with my child’s eyes, what can I do? iStrain: Is screen-time affecting your health? Do you see colour slightly different to everyone else?